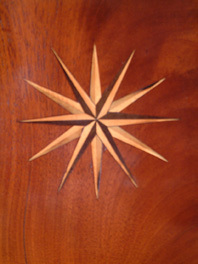 Ephraim Goodere of Worcester Longcase Mahogany Circa 1785 - Height 92in. 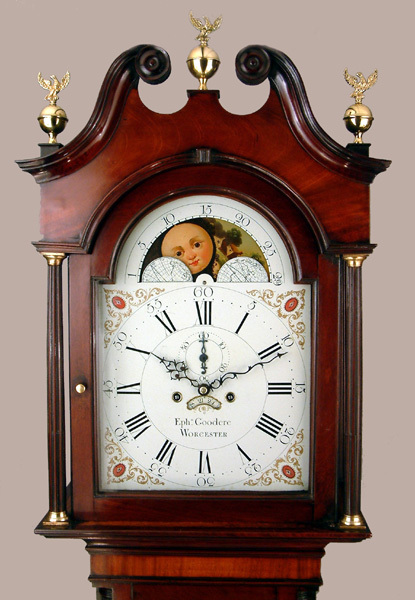 This Longcase Mahogany Archive's Maker - Ephraim Goodere is recorded "85, High St., Worcester1782 - 98.One of Worcester's leading clockmakers.Born in 1761, apprenticed in 1775 and free in 1782, the year that he married.Member of the Clockmakers Company of London until 1796.Eight day white dial longcase clocks in mahogany cases known". High quality, flame mahogany case with compass star inlay to long trunk door, reeded trunk quarter columns, swan neck pediment and bracket feet.All surmounted by three eagle ball finials. Very early 13" breakarch painted dial with moonphases to arch, subsidiary seconds dial, "sad mouth" date aperture and raised gilt gesso corner spandrels. Blued cut steel hands. Good quality 8 day movement with 4 knopped pillars.Hourly ( rack ) striking. 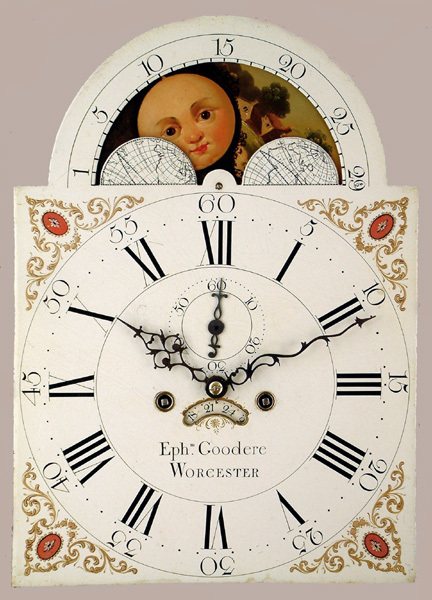 Ephraim Goodere is recorded "85, High St., Worcester1782 - 98.One of Worcester's leading clockmakers.Born in 1761, apprenticed in 1775 and free in 1782, the year that he married.Member of the Clockmakers Company of London until 1796.Eight day white dial longcase clocks in mahogany cases known". Late 18thC.Dating by style circa 1785. 92" ( 234 cms. ) or 89.4" ( 227 cms. ) ex. finials.